Heat oil in Dutch oven over medium-high heat until shimmering. Add wine, clam juice, 1/4 teaspoon of salt, and 1/8 teaspoon of pepper; bring to a boil. Add Shrimp, cover and cook until shrimp are slightly translucent, about 2 minutes. 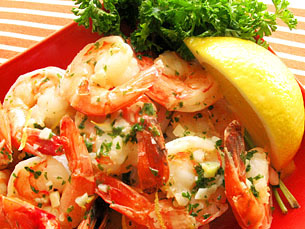 Reduce heat to medium, stir, cover and cook until shrimp are just cooked through, about 2 minutes. Using a slotted spoon, transfer shrimp to medium bowl. Bring sauce to boil over medium-high heat and cook until reduced by half, about 1 minute. Whisk butter, 1 Tablespoon at a time, into sauce; stir in lemon juice and parsley. Season to taste and pour mixture over shrimp in serving bowl. i was wondering if i could substitute anything for the wine and clam juice. You could substitute fish stock for the clam juice and wine. I’ve never tried it, but apple juice might also be worth a try! Good Luck! Great video! I learned a lot – thanks. Shrimp scampi are delicious and can be cooked in minutes! They are perfect when you have no time to cook. You just have to follow a few simple steps and you’ll be ready to eat a tasty, zesty meal!